Apart from large scale dynamic simulation models for Operator Training Simulators, we also regularly do smaller projects and interesting case studies. In this blog post I will discuss the use of a dynamic simulation model during the design phase of a steam boiler project of one of our customers. Apart from large scale dynamic simulation models for Operator Training Simulators, we also regularly do smaller projects and interesting case studies. In this blog post I will discuss the use of a dynamic simulation model during the design phase of a steam boiler project of one of our customers. They were interested in how their new boilers would behave dynamically and how their existing control structure would be affected by these new boilers. 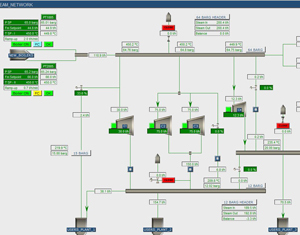 With the aid of our dynamic simulation tool, they managed to successfully make some necessary changes to both their equipment and their control system, before the boilers were in service. A Chemical Company invested in two steam boilers, which should provide steam to a 64 barg steam header and a connected steam network (including 20, 15, 12 barg headers and several lower pressure headers). The network is also kept on pressure by external suppliers. Before the company invested in the new boilers, the steam network was pressurized by the steam of a large 75 barg network of an external supplier (via a pipeline of several kilometers). The new setup would decrease the capacity (smaller holdup because of shorter distances) and therefore the company was interested in the dynamic behavior of the various steam headers in case of failure of one of the steam suppliers or other non-nominal behavior (e.g. trips in parts of the connected plants). Based on findings, the planned rules could then be adjusted. Using the supplied documents (PFD’s, P&ID’s, equipment details, etc.) and consultation with company process engineers, Mobatec set up a dynamic model, tested and tuned for the steam network. After the model was delivered, the company could perform a lot of different scenarios with the model. Simplified models of all boilers, based on the boiler volume and the heat input to generate steam. The steam network with the main steam headers and the important control valves and controls. The main customers of steam headers were modeled as “tunable customers”, such that they show realistic steam consumption under different conditions. All controllers, control loops and logics of interest were included in the model. For the simulation only the water / steam system was important. For the process conditions on the part of the steam consumers, reasonable estimates were made, as far as was relevant, in consultation with company’s process engineers. The company engineers thought of a lot of different possible scenarios and it was easy for them to implement and run these and plot and discuss relevant results. As expected, the dynamic model confirmed that the steam headers reacted a lot quicker to offsets and disturbances with the new boiler setup as compared to previous setup (with the external supplier of 75 barg steam). The new boiler setup was designed to operate at roughly 50% of its capacity, such that the boilers could ramp-up (or down) in case of a disturbance (like the failure of an external boiler). It was found that for most disturbances the new design and the proposed control system were just ok and the pressures in the headers would not drop below critical values, such that no (parts of) plants should be shut down. An important change had to be implemented in the field, though, to make sure that certain plant parts would not trip after a disturbance in the steam network. The model predicted that the current size of a main “let down valve” between the 20 barg and 12 barg header was too small to cope with dynamic changes, causing one header to blow off steam, while the other dropped in pressure. Therefore, the actual valve was replaced before the new boilers where in place. All in all, it was a very nice project, with very positive results for the involved companies. Our customer gained better insight in the dynamic behavior of their steam network and we used the feedback of them to further improve our tools. Let us know what you think about using dynamic simulation for industrial cases in the comment box below, such that we can all learn something from it. The modelling methodology behind Mobatec Modeller assumes that any process can be broken down into systems and connections. Systems represent a capacity, able to store mass and energy. Connections represent the transfer of mass and energy between the defined systems. So far, however, we have dealt with “lumped” systems as a basic modelling element. Lumped systems are assumed to have uniform properties over their entire volume. A typical example of such a system is a simple (one phase) CSTR, as the whole volume is assumed to be ideally mixed. In that case, mathematically speaking we are calculating the assumed “uniform point” properties & behaviour and are using the volume of the system to quantify the system, i.e. calculate the defined system performance. From a mathematics point of view this is DAE (Differential Algebraic Equation) problem, containing Ordinary Differential Equations (ODE) and Algebraic Equations (AE), where the time is only independent variable. ODE’s are representing the balances (mass & heat) equations of the systems while AE’s are called constitutive equations and are used to define each system properties. What is a modelling strategy towards non-uniform systems? A cascade of lumped systems can be used to simulate (already existing) non-uniform systems successfully enough, but if the model goal is the design, optimization and model based innovation of such systems, then the model made would need to take spatial coordinates of the modelled system into account as independent variables as well. From mathematics point of view this problem then becomes PDAE – Partial Differential and Algebraic Equations problem. In this months blog we are going to talk about the Distributed Parameter System modelling in Mobatec Modeller, a solution strategy, and numerical methods used. Distributed parameter systems are systems that cannot be considered to have uniform properties over their entire volume, hence they are called “distributed parameter” as their properties are time and space dependent. Typical representatives of such a systems are plug flow & packed bed reactors, fixed or moving bed columns, catalytic pellets, etc. Dominant phenomena in these systems are convective and dispersive/diffusive mass & heat transfer. In order to solve these type of problems space discretization numerical methods are required. Numerical discretization of a time-dependent partial diﬀerential equation (PDE) includes the following approaches: Fully-discretized in both time and space and Method of Lines. In Mobatec Modeller we employ the Method of Lines approach (MOL). (MOL) approach: discretize in space ﬁrst, transform PDEs to ordinary diﬀerential equations (ODEs); and then using the time integration method of ODEs to advance in time. There are several spatial discretization methods: Finite Diﬀerence Method (FDM), Finite Volume Method (FVM), Finite Element Method (FEM), Spectral and Pseudo-spectral Method. Finite Diﬀerence Methods (FDM) are adopted as dominant approach to numerical solution of PDE’s and are used in Mobatec Modeller. FFDM is using the point after the focus point. The arrow tip is showing the integration direction, which is from Z=Z towards Z=0. So we use FFDM if the outlet BC is known. BFDM is using the point before the focus point. The arrow tip is showing the integration direction, which is from Z=0 towards Z=Z. So we use BFDM if the inlet BC is known. “O” is representing the terms in the Taylor series expansion that are being neglected and is representing the error of the finite approximation. First order error is of the order of spatial step taken O(h). Second order error derivative approximation is obtained by including one more point in the approximation expression. For FFDM that is F(x+2h) point, and for BFDM is F(x-2h) point. The error is of the order of spatial step squared O(h2) which is more accurate solution taking that h->0. CFDM is using the point before and the point after the focus point. The arrow tip is showing the integration direction, which is from Z=0 towards Z=Z. 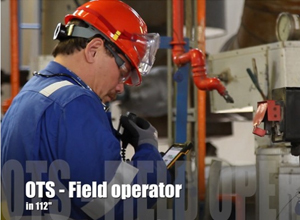 In order to employ CFDM we use BFDM at the inlet BC point and FFDM at the outlet BC point. In the middle – throughout the distributed domain CFDM is used. This subject will be tackled in detail in a next blog once we get to know the methods properties. The smaller the spatial step (h->0) the better the finite approximations of the derivatives are. The same goes with higher error order. In real case the desired solution would be an optimal number of spatial elements (spatial step size) over the distributed domain length. Too much spatial steps -> very small step size h, would take too much computational time and effort. The error order is of the spatial step size so they are not used that much. Main use is for purely convective terms -> first derivative finite approximation. CFDM can be successfully used for mixed convective and (purely) diffusive/dispersive terms. Knowledge on numerical methods is essential for their successful application in real life engineering problems. In the next blog on this topic, we will explain the application of FD methods in Mobatec Modeller and why it is important that this part of the PDE solution strategy needs to remain a “white box” – available for user to interact with in order to be able to make the models to converge and not have their hands “tied together”. What is your experience with Distributed Parameter System modelling and numerical methods used? Did you ever run into convergence problems without knowing what the cause was? The modelling methodology implemented in Mobatec Modeller makes use of several topologies, the Physical Topology, Species Topology and Equation Topology. The idea of the construction of the species topology is to facilitate the definition and identification of species and reactions occurring in various parts of the processing plant. The species topology defines which species are present in which part of the process and thus defines the basics of the chemistry/biology of a processing plant model. This enables the generation of the relevant balances of extensive quantities for the systems. The species topology is superimposed on the physical topology. Its construction efficiently aids the model designer in the definition of the chemistry/biology of the processing plant because it generates knowledge about which species are present in every system in a physical topology and about which reactions occur in every reactive system. It should be noted that at this stage of the model definition process the quantities of the species in the systems are of no relevance. The association of a certain species with a certain system only implies that this system has a capacity for this particular species. If, for example, a system Σ is associated with only one species, S, then this implies that species S is the only species that can be present in system Σ. It does not imply that S has to be present in Σ. At certain moments or maybe all the time during an evolution/simulation of the process, species S may even be absent. At these particular moments the system has no mass, but of course still has a capacity to store the species S.
The existence of certain species and reactions in one part of the system does not imply that they are the same in all parts of the system. In principle, however, every chemical or biological species could be present in any part of the system, so one could decide not to construct the species topology and only generate a global set of species. This would mean that one defines only one set of species, which comprises all species that appear in the whole plant. Every system of the physical topology would then consist of all these species. For each species in each system the species mass balances could then be generated, which would of course result in a flood of equations. In most cases, many of these equations would be obsolete, because species are usually constrained to a group of systems and therefore do not appear in every system. 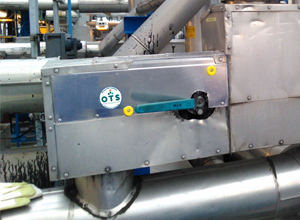 The species of the fluids in the two parts of a shell and tube heat exchanger, for example, are usually not the same. 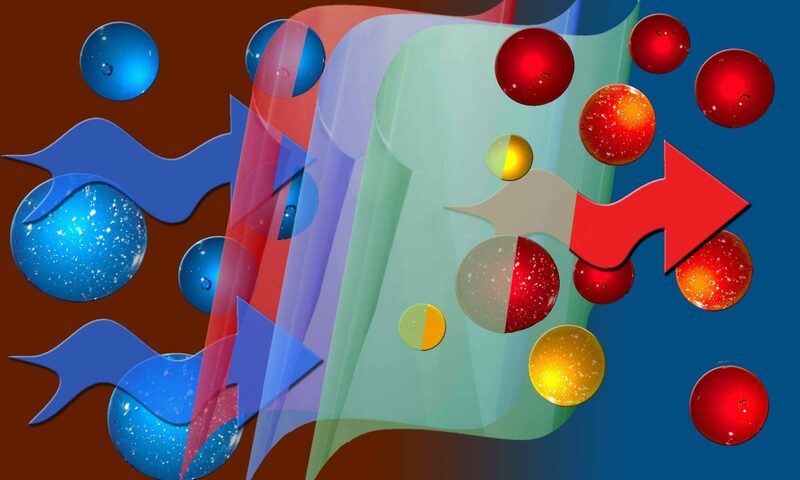 To aid in the definition of the species topology, species and reaction databases are used and three concepts are introduced, “permeability”, “directionality” and “reactions”, which support the idea of locality of chemical or biological species. These three concepts will facilitate the definition of the species topology and will be illustrated in the next sections. The permeability and directionality concepts are associated with connections and therefore with the common boundary element which the two connected systems have in common. The permeability is defined as a property of a mass connection, which constrains the mass exchange between systems by making the species transfer selective. 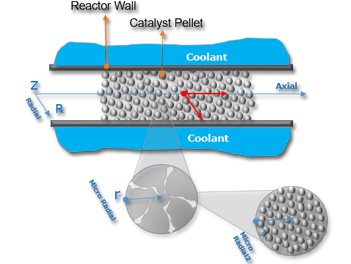 The mass connection is then defined as a semi-permeable thermodynamic wall. An example of a process where the permeability concept could come in handy is a simple diffusion process. The application of the selective constraint on the transportation of species can also assist in the representation of separation processes, such as ultra-filtration or reverse osmosis. Consider a tank which contains two immiscible phases A and B (figure a). Phase A consists of species P and Q. Phase B consists of species P and R. The simplest way to describe the diffusion of species P from phase A to phase B (or the other way around) is shown in figure b, which represents a physical topology of the diffusion process. The two phases are each modelled as a simple lumped system and between the systems exists a mass connection which describes the transfer of all species between those systems. Note that the direction of the connection is only a convention, defining a reference direction for the actual stream. The actual direction of the flow depends on the driving force, which in this case would be the difference in chemical potentials of P in each phase. To prevent the species Q and R from being transferred through the connection, the permeability concept is introduced: The connection between the two systems is defined as a semi-permeable thermodynamic wall, which is only permeable for species P. This means that only the species P will be transferred through the connection and that, consequently, the transfer terms of the other species (Q and R) will not appear in the (component) mass balances of the systems because they are not transferred. Note that in principle the permeability concept does not have to be limited to mass c.q. species. The concept can be readily extended to any extensive quantity. In practice, though, this is not necessary as one normally distinguishes between mass, heat, momentum and work transfer, which are all handled individually. The concept of (uni- or bi-) directionality is also a property that is related with mass connections. The species topology, as it was described so far, allows for bi- directional flow in any mass connection. Since the flow is (normally) dependent on the state of the two connected systems, nothing can be said a priori about the direction of the actual flow. In fact, in many situations the flow would change in the course of the time interval over which the process is being observed. Species that are not inhibited by a defined permeability may thus appear on both sides of the connection, when computing the species topology. In many applications, though, one-directional flows are assumed and thus species propagate in a constraint flow pattern across the network. This desired behaviour calls for defining two classes of mass connections, namely uni-directional and bi-directional, where the latter should be the normal case as it leaves the system unconstraint. Inversion of the flow for a uni-directional flow would have to be handled as an exception as it contradicts the validity range of the model. The reaction concept more or less speaks for itself. A chemical or biological reaction is a mechanism that transforms a set of species, the reactants, into a set of different species, the products. At this stage of defining the species topology it is only necessary to know which species are transformed and which species are generated in every (reactive) thermodynamic system. The properties of reactions (kinetic laws, heat of reaction, etc.) and the conditions under which the reaction may take place are introduced at a later stage.